Youthmarket's training program prepares young people to plan and operate a farm stand business while educating them about health, nutrition, the environment, and regional agriculture. Youthmarket training emphasizes the importance of fruits and vegetables to a healthy lifestyle and encourages participants to bring the message of good diet to their friends and customers. The training program also helps youth to think critically about the food in their bodegas and supermarkets and the benefits of eating locally produced fruits and vegetables. On the operational side, Youthmarket business training focuses on promotion, merchandising, and customer service and includes a hands-on training and a tour of the Union Square Greenmarket. Last year, more than 65 enthusiastic young people found seasonal employment at Youthmarket farm stands, earning their own money during the 21-week season. 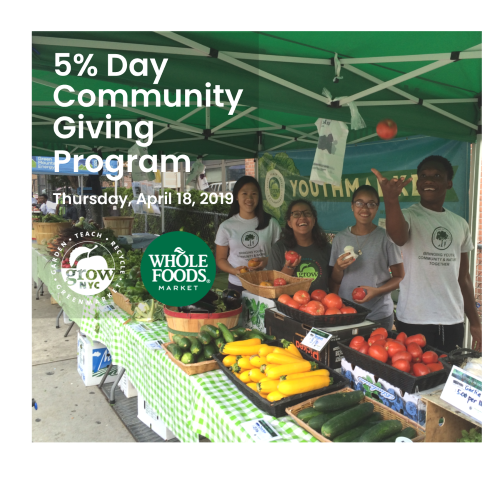 This year we'll continue to reach young people in NYC, giving them the opportunity to serve their communities, learn job skills firsthand, and gain knowledge about nutrition, food systems, and their environment.